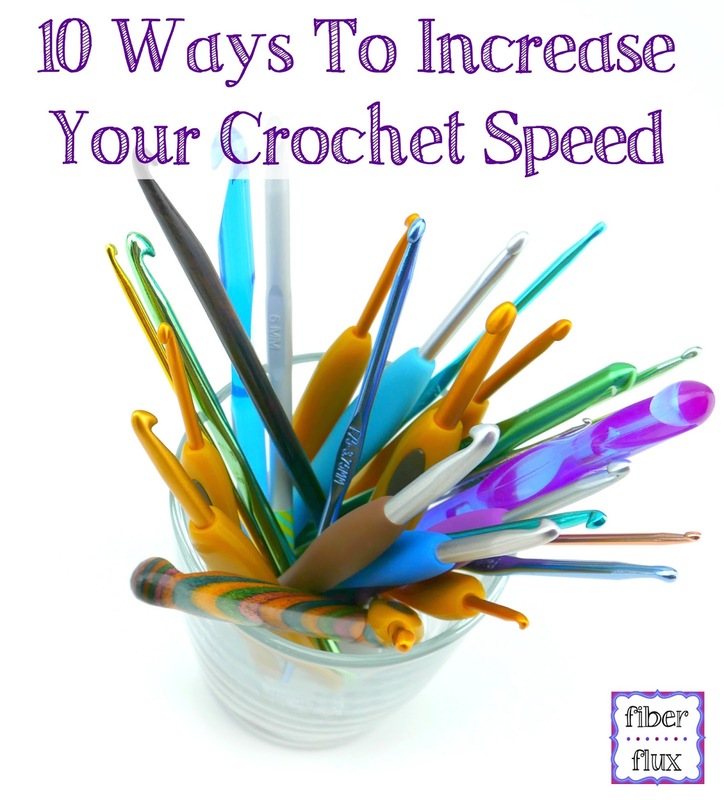 Fiber Flux: Give Your Crochet Speed A Boost With These 10 Tips! Give Your Crochet Speed A Boost With These 10 Tips! I get this question from readers fairly often...how can I become a faster crocheter? This is a great question! Although I am more of a kick back and relax type of crocheter, sometimes we need to just get a project DONE. As you learn and practice your speed will naturally increase, but here are some ideas to try out. I asked a couple of crochet friends and got some fabulous ideas too. Experimentation is key, you never know what you might discover! When working on your stitches, always remember that neatness, tension, and gauge are very important too. Above all, enjoy yourself! Have any more tips that you'd like to share with us? Please comment below! 1. Practice, practice, then practice some more. As you learn and grow as a crocheter, increased speed will come. Your hands and fingers will become more accustomed to manipulating the yarn and holding everything all at once. 2. Check your tension...too tight can slow your down and even cause pain too! Loosen up as much as you feel comfortable, so that the yarn "glides" over the hook in a relaxing fluid movement. 3. Work in a distraction-free environment..I know, I know I'm crazy for even suggesting that, but a quiet place like a waiting room, in your favorite chair, or parked in a car waiting for someone are almost magical ways to focus on the task at hand. 4. Experiment with different types of hooks. Do you like wood? Metal? Ergonomic? Try buying just one hook size at a time before committing to a full set. 5. Do you use only tapered? Or are you an inline hook kind of stitcher? Try another...for example if you've always used tapered hooks, give inline a whirl. You may find it changes your crochet too...but maybe not! Experimentation is important. Learn the difference HERE. 6. Are you a pencil or a knife gripper? Switch and see if your crochet changes. I definitely crochet faster with the knife grip, but other crocheters are faster with the pencil grip for example. 7. Zone out with a show, audio book, or good music. Many crocheters claim that watching their favorite show, listening to a great book or favorite music will allow them to work lots of mindless stitches and before you know it, you have a whole section done...yay! 8. Simplify! Know the stitches you will be using. If possible memorize the pattern or parts of the pattern you'll be using. If I am working a pattern for the second time around, I tend to whip up a project faster. 9. Try a center pull ball of yarn so that the yarn "flows" from the ball and you don't need to fiddle with it as much. 10. I think this is the most important thing of all...relax and breathe! So many of us are attracted to making things because of the enjoyment and relaxation they provide. When you relax and crochet often, it will feel like second nature. Remember to have fun! DC DC SC sk HDC. Thank you for this article and the reminder that neatness is important too. I crochet faster when it is a familiar stitch and I can zone out to a TV show. 2 other things I might add: 1) work in a well lit area. I have found that very important. 2) work in an area where you are comfortable with plenty of elbow room. Oh, I just thought of something else, I crochet with the yarn on my left side, maybe try both sides and see which is faster.